It has been announced by “Wheel of Fortune” and Vanna White who have been chosen to be the lucky finalist in their first-ever, once-in-a-lifetime chance to win the ultimate “Wheel of Fortune” grand prize of being “Vanna for a Day” in their fan contest. Among the plus $1,000 videos that were submitted, the producers decided on these five favorites: 1) Katie C. – Her natural obsession with letters and the game show, make her “a freak of nature” as she describes herself. 2) Samantha M. – who says “I walk well in heels and I’ll even dye my tresses”. 3) Anna H. – Two of her reasons for being Vanna are “I basically live in evening gowns, and I was actually on Wheel of Fortune and I won!” 4) Barbara V. -Says, “at 73 (years) I would love to be a hostess of America’s favorite game show, even if it’s for one day”. 5) Shenette H. – “No longer will I allow life to happen to me. But, I will happen to my life”. You can watch their video pitches for yourselves at: www.wheeloffortune.com/vannaforaday. Remember to vote! You are allowed to vote once per day until Febrary 7th. We already voted for our favorite! 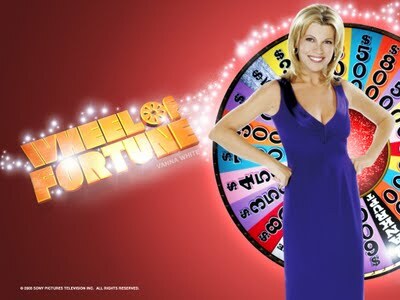 Wheel of Fortuneâ€™s â€œVanna for a Dayâ€ will be announced on air and online on Thursday, February 24. The winner will be flown to Los Angeles, stay at a luxury hotel, and receive star treatment from Vanna’s own wardrobe mistress, hair stylist, and make-up artist then will join Pat Sajak on the Wheel of Fortune stage at Sony Pictures Studios. I think a brunette or redhead should be “Vanna for a day” because we already have the best blond for the job! Vanna White has aged so gracefully, she is so beautiful! You won’t get to see the Vanna For A Day episode because Coonball overrules.